With a continuing streak of below-average temperatures across the area, I decided to head down to Ft. Ord National Monument for some unfinished business there. I had been through the area on several previous occasions, but had somehow missed the monument highpoint, the only point within the 14,000+ acre monument with more than 300ft of prominence. In addition, there was a named summit on the west edge that I had likewise missed, Artillery Hill. The other points I visited were a few unnamed, but ranked summits in the Gilroy area and a few minor points around Artillery Hill. Most of the mileage was done on my mountain bike, but overall it was a nice combination of biking and hiking that kept me busy for half the day. Poking around peakbagger.com, I noticed that Laura Newman had tagged this lowly hill in southern Santa Clara County - practically in my backyard. I'd planned to stop by on my way back from Ft. Ord if I still had the energy, but veered off the freeway at the last minute, deciding to do it first. Located in an upscale neighborhood of Gilroy, a pair of water tanks are found at the summit, the highpoint somewhere around the periphery of the tanks which sit in a shallow bowl. There is an exceedingly short approach from the end of Periwinkle Dr that ends at the water tanks. I somehow missed this and ended up on Sunflower Cir, the longer, but still easy approach (which takes all of 6-7min). A sign where I parked indicated the summit area is all scheduled to be developed by the same LLC that built the neighborhood lower down. For now, the area is sort of a green space for the local residents who use the hill for local hikes and morning workouts. A paved road runs to the summit. It is gated at both ends, but a turnstyle allows hikers to pass from the Sunflower entrance. At the Periwinkle Dr side, one simply walks around the fence to the right to gain access to the top. There are some nice views overlooking the Santa Cruz Mtns and the surrounding countryside. Located 2mi to the northwest of Peak 640ft, Peak 886ft lies just east of Watsonville Rd and entirely within private property. 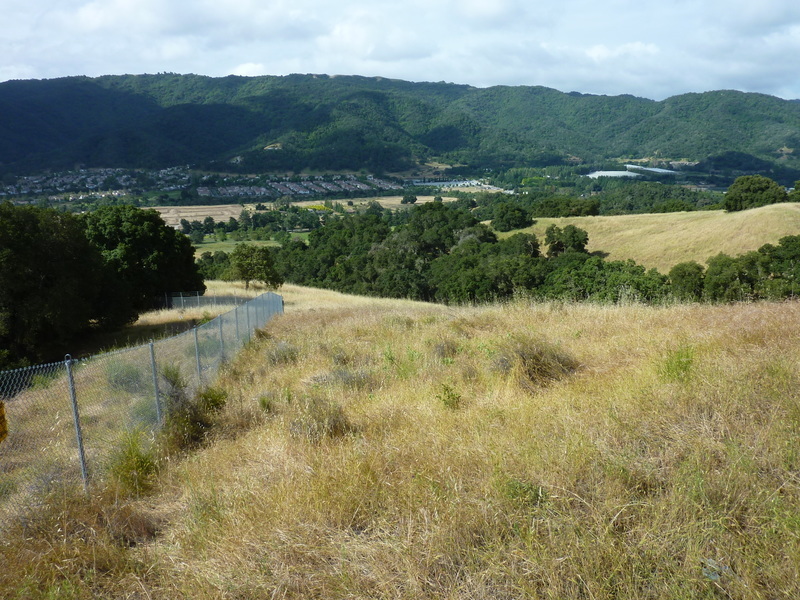 There is an old ranch road running up a ridgeline from the west off Watsonville Rd, starting immediately across the road from a couple of homes facing the peak. From my satellite view inspection beforehand, I thought the road started further south a couple hundred yards. That approach worked, but the better route was the more direct start to the west which I used on the return. The road climbs steadily up the hill, passing through a gate to a fenced olive orchard that was planted in the past few years but seems to be minimally maintained. The road ends at the top of the property where a couple of plastic water tanks are found below the summit. One must cross over a few fences here to reach the highest point among a few old oak trees, views rather meager. It took about 40min for the roundtrip effort. With the preliminaries dispensed with, I was back in the car driving to Ft. Ord. My drive through Salinas took me by a street-side Trump rally. The folks picketing with Trump "Strong America" and other slogans all looked to be about my age, all white, both men and women. They may have been the sum total of all the white people living in town. Ironically, Salinas is the heart of the rich farmland in the Salinas Valley. If Trump managed to build his wall and deport all the illegals as he plans, Salinas would become an economic wasteland. I wondered if they'd still be out there picketing once that happened. But I digress. Peak 950ft is located immediately east of the Mazda Raceway (formally the Laguna Seca Raceway) which itself is a modestly-sized enclave at the edge of Ft. Ord. Others on Peakbagger.com reported approaching from the campground at the raceway, some finding access restricted during events. This approach makes the hike something like a 5min exercise, easy enough, but dependent on the race schedule. One can also approach from other directions within the monument, the nearest alternative being the Badger Hills TH off SR68. This makes for a 5mi roundtrip effort, one made considerably easier by the use of a mountain bike which is allowed access to pretty much all of the roads and trails in the national monument. I started off on my bike from this TH around 11:30a, ascending the Guidotti and Skyline Trails, climbing about 800ft in the process. The weather was mostly overcast, which along with a good breeze kept temps in the 60s, excellent for riding or hiking. It took about 25min to ride to the top, found off a rough spur road from the Skyline Trail. To reach the actual highpoint, one has to walk through some tall, dry grass (I had been hoping I was done with picking stickers out of my socks...) and look for it under some oaks growing just above a small quarry site. There are better views from the trail, particularly looking south to Mt. Toro. I could hear the roar of engines coming from the raceway so I decided to go over and check it out. Turns out I was able to access the raceway over an ungated bridge, allowing me a close-up view of the action. It looked to be amateur day, with folks in BMWs and Miatas zooming around the curvy track at about 60-70mph. It didn't take but a few minutes before I got bored and headed back out the way I'd come. Motorsports just isn't my thing. I made a longer return of it by following the Skyline and Oil Well Trails back down, a very enjoyable series of ridge rides with open views. I got back to the Badger Hills TH after 12:30p for just over an hour's effort.